The distinction wasn’t entirely satisfying; first and foremost the power of both aggregators and platforms, however defined, ultimately rests on the size and strength of their userbase. Moreover, Google and Facebook have platform-type aspects to their business, and Apple has aggregator characteristics when it comes to its control of the App Store (that Microsoft does not is a symbol of the company’s mobile failure). Moreover, what of companies like Amazon, or Netflix? In a follow-up Daily Update I classified the former as a platform and the latter as an aggregator, but clearly both have very different businesses — and supplier relationships — than either Google and Facebook on one side or Apple and Microsoft on the other, even as they both derive their power from owning the customer relationship. Make no mistake, that bit about owning the customer relationship remains critical: that is the critical insight of Aggregation Theory. How that ownership of the customer translates into an enduring moat, though, depends on the interaction of two distinct attributes: supplier differentiation and network effects. Facebook has commoditized suppliers more than anyone: an article from the New York Times is treated no differently from a BuzzFeed quiz or the latest picture of your niece or an advertisement. Google gives slightly more deference to established content providers, but not much; search results are presented the same regardless of their source (although Google increasingly presents results differently depending on the type of content). Amazon is a little harder to classify — that’s kind of entailed in the name The Everything Store — but generally brands are much less important than they are in a world of limited shelf space, and few people even realize they are buying from the 3rd party merchants that make up over half of Amazon’s sales. Differentiation matters more for Netflix, particularly when it comes to acquiring new users; still, users are transacting with Netflix and, the longer they stick with the streaming service, first opening Netflix and then looking for something to watch, as opposed to the other way around. Apple first and foremost attracts and retains users through its integrated experience, but that experience would quickly be abandoned were there not third party apps. 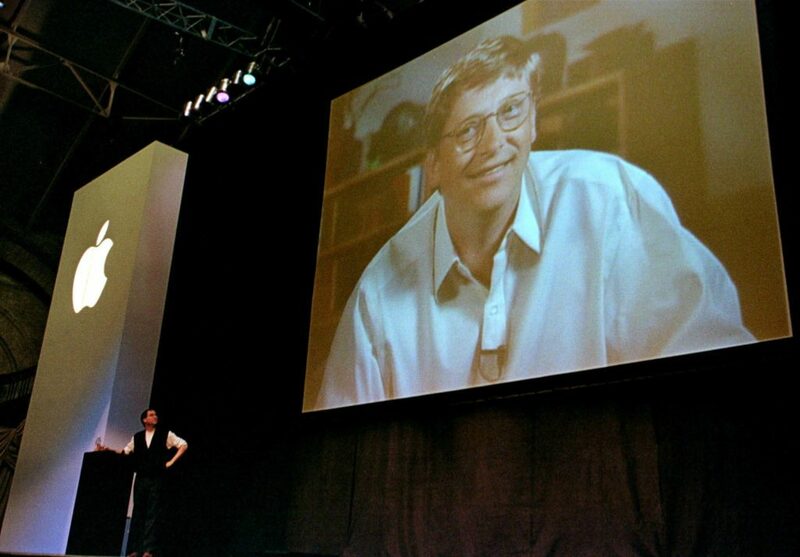 Microsoft traditionally succeeded entirely because of its ecosystem, not just applications but also the entire universe of value-added resellers, systems integrators, etc. The extremes make the point: Facebook could lose all of its third party content providers overnight and still be a compelling service; Microsoft without third parties would be, well, we already saw with Windows Phone. For Facebook the network effect that matters is users — a social network’s most important feature is whether your friends and family are using it. This network — given it is the product! — is completely internal to Facebook. Google has network effects of its own, but they are less about users and more about data: more people searching makes for better search results, because of the system Google has built to relentlessly harvest, analyze, and iterate on data. Like Facebook, Google’s network effect is largely internal to Google. Amazon’s network effect is more subtle: there is an aspect where your shopping on Amazon improves my experience through things like rankings, reviews, and data feedback loops. Just as important, though, are two additional effects: first, the more people that shop on Amazon, the more likely suppliers are to come onto Amazon’s platform, increasing price and selection for everyone. In other words, Amazon, particularly as it transitions to being more of a commerce platform and less of a retailer, is a two-sided network. There is one more factor though: Amazon’s incredible service rests on hundreds of billions of dollars in investments; that fixed cost investment has to be born by customers at some point, which means the more customers there are the less any one customer is responsible for those fixed costs (this manifests indirectly through lower prices and better service). Netflix is a hybrid much like Amazon: there are certainly data network effects when it comes to what shows are made, what are cancelled, recommendations, ratings, etc. An essential part of Netflix’s competitive advantage going forward, though, rests on its differentiated ability to invest in new shows; this investment capability is driven by the company’s huge and still-growing user base, which is the biggest way that additional users benefit users already on the service. Apple certainly benefits from a large user base over which to spread the significant fixed costs of its products, but on this end of the spectrum it is the two-sided network of developers and users that is most important. The more users that are on a platform, the more developers there will be, which increases the value of the platform for everyone. Microsoft, befitting the point I made above about the expansiveness of its ecosystem, has the most “externalized” network effect of all: there is very little about Windows, for example, that produces a network effect (Office is another story), but the ecosystem on top of Windows produced one of the greatest network effects ever. At this point, you may have noticed that these two spectrums run in roughly the same order: I don’t think that is a coincidence. It is just as useful to think about what happens when companies find themselves outside of the Moat Map. I wrote in 2013 that I believe this experience resulted in Apple making poor strategic choices with the iPhone and iPad: the company never again wanted to have its suppliers become too powerful. The way this played out, though, is that Apple for years neglected the business model needs of developers building robust productivity apps that could have meaningfully differentiated iOS devices from Android. To be sure, the company has been more than fine: its developer ecosystem is plenty strong enough to allow the company’s product chops to come to the fore. I continue to believe, though, that Apple’s moat could be even deeper had the company considered the above Moat Map: the network effects of a platform like iOS are mostly externalized,2 which means that highly differentiated suppliers are the best means to deepen the moat; unfortunately Apple for too long didn’t allow for suitable business models. Another example is Uber: on the one hand, Uber’s suppliers are completely commoditized. This might seem like a good thing! The problem, though, is that Uber’s network effects are completely externalized: drivers come on to the platform to serve riders, which in turn makes the network more attractive to riders. This leaves Uber outside the Moat Map. The result is that Uber’s position is very difficult to defend; it is easier to imagine a successful company that has internalized large parts of its network (by owning its own fleet, for example), or done more to differentiate its suppliers. The company may very well succeed thanks to the power from owning the customer relationship, but it will be a slog. On the opposite side of the map are phone carriers in a post-iPhone world: carriers have strong network effects, both in terms of service as well as in the allocation of fixed costs. Their profit potential, though, was severely curtailed by the emergence of the iPhone as a highly differentiated supplier. Suddenly, for the first time, customers chose their carrier on the basis of whether or not their preferred phone worked there; today, every carrier has the iPhone, but the process of reaching that point meant the complete destruction of carrier dreams of value-added services, and a lot more competition on capital-intensive factors like coverage and price. It’s worth noting that maps can take two forms: some give direction, and others provide context for what has already happened; I’m not entirely sure which best describes the Moat Map. 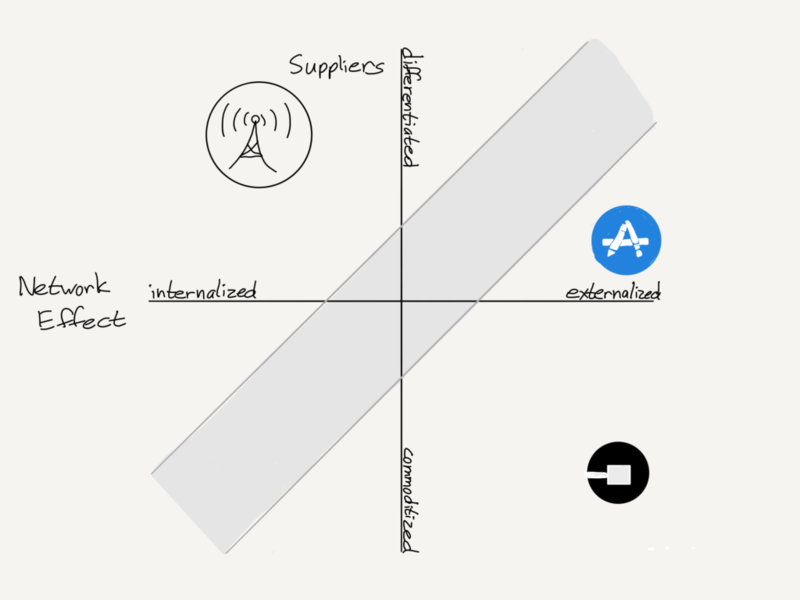 In the case of Apple and apps, for example, I absolutely believe the company could have made different strategic choices had it fully appreciated the interaction between supplier differentiation and network effects. 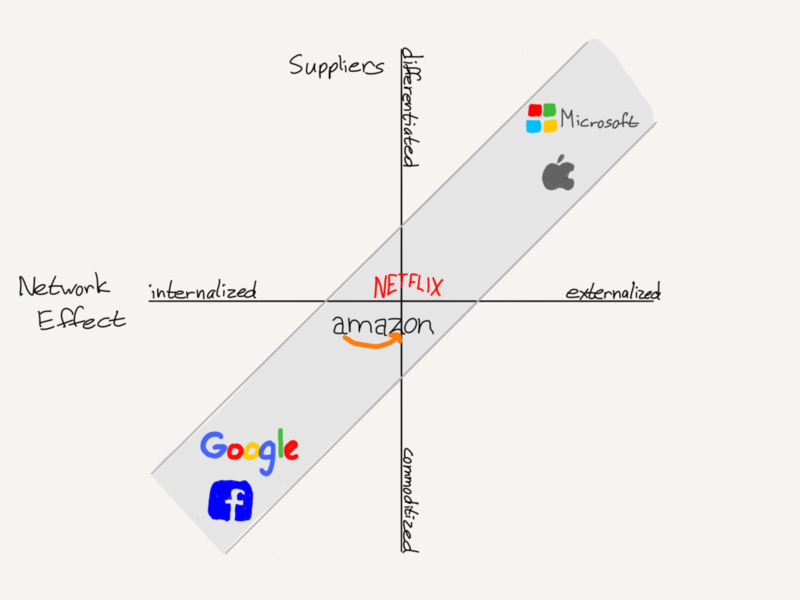 On the other hand, one could make a very strong case that the degree of supplier differentiation possible flows from the network effect involved: perhaps it was inevitable that Facebook and Google commoditized suppliers, for example, or that Amazon and Netflix would have to simultaneously pursue differentiated suppliers even as they sought to suppress them. What is always certain, though, is that there is no one perfect strategy: as always, it depends.